Join us in raising funds and awareness for United Hatzalah of Israel. We are doing this In Memory Of Our Friend Ezra Schwartz . Due to your generosity, we have exceeded our original goal and have therefore increased our goal. The additional funds will give us the opportunity to create a space in Ezra's name at the new United Hatzalah headquarters in Jerusalem. This space will be designated to enhance emergency lifesaving. We are truly grateful for all of your support. 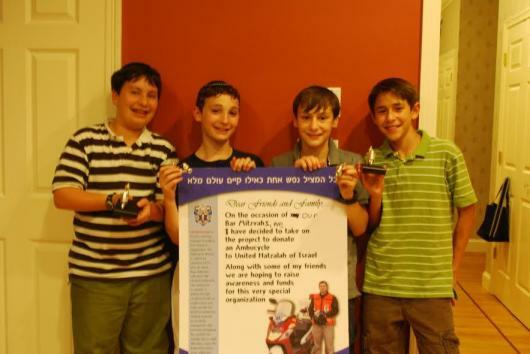 Seven years ago, in 2010, four of us, Josh Hanau, Dani Lerner, Ariel Goldman and Ezra Schwartz , childhood friends from Sharon, Massachusetts, decided to raise money for United Hatzalah in honor of our Bar Mitzvahs. Together with our families, we raised money to purchase an Ambucycle, a motorcycle Â fully stocked Â with medical equipment that provides the quickest medical response to accidents, emergencies and terror attacks throughout Israel. Over the years,we were updated on our Ambucycle's driver, and his lifesaving feats as a result of our Ambucycle's quick response time. Our Ambucycle made many calls and saved many lives over the years. Unfortunately, this past September, our ambucycle was retired due to mechanical issues. We were told that it was the most senior Ambucycle, saving lives for over 7 years. Sadly, Ezra was killed in a terrorist attack in Gush Etzion, in Israel, on November 19th, 2015. We were all spending our gap year between High school and college in Israel. Following Ezra's death, our Ambucycle, with our names written on it, driving through the hills of Jerusalem and saving lives gave us comfort. Losing Ezra in Israel and in such a tragic way made us even more aware of how important our Ambucycle was to the people of Israel. We received the news that our Ambucycle was going to be retired just months before Ezra's second yahrzeit. His death has been life changing for each of us and our families.Â Together with our families and Ezra's family, we would like to fund another Ambucycle in honor and in memory of our best friend, Ezra. Please join us in this effort to raise money for Ezra's Ambucycle. We appreciate any donation you can give. A lot of hatzlacha! A great cause. Miss you Ez. What an impressive and worthwhile endeavor. May it be an aliyah for Ezra's neshama. An amazing tribute and fitting way to commemorate Ezra's yahrtzeit. Mazel Tov on your great idea! The rest of the money raised in the Brandeis Orthodox community in memory of Ezra z'l. In memory of Ezra from Ruth's friends at Enable. May your memories of Ezra's goodness inspire more acts of lovingkindness. What you have undertaken is a wonderful mitzvah. May the memory of Ezra's life be celebrated, and may he live on in all our hearts. May his memory continue as a blessing. What a meaningful tribute to Ezra Schwartz z"l's memory. In loving memory of Ezra z'l. I daven that Hashem should send nechama to his friends and family. Tizku lemitzvos. May Ezra's memory continue to be a blessing! With our love and wishes for a beautiful aliyah for Ezra's incredible neshama. From Zach and Emunah Homa and family. Dear Josh, Dani, and Ariel, What a meaningful tribute to Ezra and for such a worthy cause. Your families must be proud that your acts of chesed continue way past your bar mitzvahs, and hopefully will continue for many years to come. This is a wonderful thing you are doing. May Ezra's Nishama continue to have the merit for his influence and impact on others, always. In memory of the most incredible person I've ever met, and to a best friend who I miss every day. Ezra will forever be missed and I hope that many more great things like this will continue to be done in his name! Thanks for the wonderful work you are doing to raise the money. Kol hakavod. So very special. I am so sorry for your loss. I will never forget about Ezra and you, his family. I will continue to keep all of you in my thoughts and prayers. What a beautiful tribute for an obviously very, very special young man who touched countless lives. What an amazing tribute to Ezraâ€™s memory. Kol HaKavod!! This is amazing, guys. Tizku l'mitzvot! This is really a beautiful initiative that y'all are doing. Sending you all lots of love and hatzlacha raba with this!! Keep doing what you're doing, and Ezra sure lives on through you. I am proud to support each of Ezra's friends in this effort. What a beautiful tribute. I am a friend of Ezra's Z"L Aunt Pamela. Good luck reaching your goal. What a beautiful way to honor Ezra's memory. It is even sadder that someone is murdered while doing a good deed. I wish that you will get much bigger donations than I can give. In loving memory of Ezra... Kol Hakavod to all of you for your efforts in providing support to Am Yisrael. With love from Ezra's California cousins Kimberly, Daniel, Joshua, and Rachel Rubin. Beautiful project. May his memory bring health and life to others. In memory of Ezra, zâ€l. Sending our sincerest condolences to the Schwartz family. Wonderful thing to do in memory of your friend. The bike should be used in good health. In honor of my grandson, Joshua. What a great project you have undertaken! I am sure you will be successful in your efforts and many lives will be saved because of your determination. Keep up your great work. You guys are amazing. May Ezra's memory be forever a blessing. May Ezra's memory continue to be a blessing. What a special tribute to honor the memory of your special friend...I am proud to be part of this noble cause.. So happy to support you and honor Ezra's memory. What a wonderful mitzvah you are doing while honoring your dear friend! Read about this NJ Jewish News... very inspiring! God bless you all. Rip Ezra shwartz. Thank you for sharing Ezra with us. Your story was so touching--thinking of him on his Yahrzeit. I was inspired by the article in the NJ Jewish News. May Ezra's memory be for a blessing. Thank you for allowing us to share this Mitzvah in Ezra's z"l name. May Ezraâ€™s memory continue to live on forever and inspire others to spread as many smiles and good deeds as he did and more. HatZlocha on this worthy cause. $13 in memory of the amazing summer I spent with Ezra in 2013. May his memory be a blessing. He will always be with us in our hearts. ×‘×”×¦×œ×—×”, so proud of the mitzvah that is being done in Ezra's name. Tizku lâ€™mitzvot. May Ezraâ€™s Neshama have an Aliyah in the zâ€™chut of this tremendous act. We cannot imagine the streets of Israel without this ambucycle - without Ezraâ€™s name driving through its busy streets, bringing hope and health to the Jewish people. Thank you for kick-starting such a wonderful project in honor of such a wonderful person. Proud of you guys - may Ezra's memory continue to be a blessing. I miss Ezra. And I hope that through this, we can save many lives in his name. Happy to contribute to this worthy cause! This donation is from Binny's tzedaka collection. Thank you to all the people of Sharon MA who have contributed their bottles and cans! Best of luck with this important endeavor. Vivian and Zach D.
We're so glad lives will be saved in Ezra's name, we miss him so much. Kol Hakavod Dani, Josh, Ariel! So proud of Josh Dani and Ariel for this wonderful mitzvah. With Love. Susan and Stuart Salzberg. May you all continue to do good in Ezra's name. Forever in our memories and hearts. Yashar Koach for taking the initiative and ensuring what Ezra stood for - especially helping others and making the world a better place - lives on! On and On, keep on soaring like an eagle and don't just put on a coat when it's cold; light fires to heat up everyone else as well! Behatzlacha! 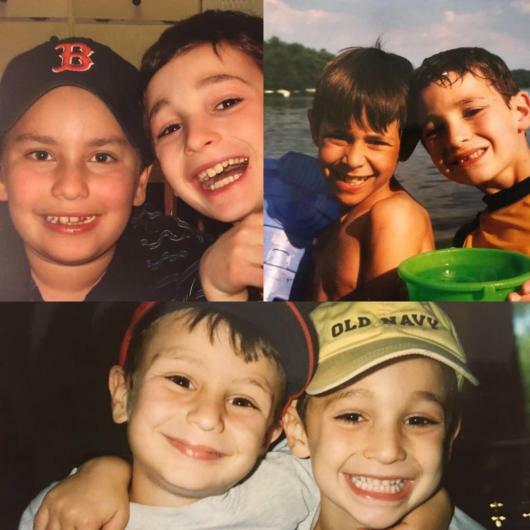 Saba and Safta - Hershell and Evelynne Goldman are so proud of you Ariel and your friends Josh and Dani for this wonderful tribute to your amazing friend Ezra Schwartz z'l. The entire Goldmeer family (especially Ezra) remembers all of you with fondness... in honor of OUR Ezra.. we donate in memory of Ezra. With great Love. Hazak ubaruch on the cause. May Ezra be ever close to Hashem. Wishing you lots of luck. Tizku lâ€™mitzvot. Best of luck with this important fundraiser. We are so proud of you. Thank you for such a sweet and wonderful way to keep Ezra's memory alive. Such an important project in memory of such a special young man. I love you all and miss you. Hope we can get together soon. Tzedaka in merit that my mother be spared of sorrow, a speedy recovery AND in honor of Ezra Schwartz, whom I have never met, but in a short time, changed the world. May grief be overcome with comfort, which I too await. Much love, and peace, always. A beautiful mitzva in Ezra's memory. In memory of Ezra who we miss so much. We're so proud to be part of this wonderful project. Glad we could do a little bit to help in this special project. May Hashem help you reach your goal and be able to honor the Memory of your friend Ezra. May his memory be a blessing for all Israel! Renee and David Heyden Delray Beach FL. An amazing and inspiring fundraiser!! Privileged to be a part of this beautiful project. What a wonderful Mitzvah you are doing for the residents of Israel while remembering Ezra. Continue to do such good deeds! As a Yavneh family we are honored to support this effort. In memory of, and in tribute to Ezra Schwartz who, in his too short life time, inspired so many. And, in honor of his friends Josh, Dani and Ariel, and their families, who strive to continue his legacy. This is a wonderful cause. Thank you for raising money to take care of Israel. Can't wait to see a whole fleet of ambucycles with Ezra's name! May Ezraâ€™s memory always be of blessings. Kol Ha Kavod. Keep up the amazing work. What a wonderful way to continue growing the goodness that you began almost 10 years ago. What a meaningful tribute, kol hakavod for doing this in Ezraâ€™s memory. With love from Naomi, Tzvi, and Naftali Grossman. May his memory always live on. Kol Hakavod to you for facilitating this noblest form of ×ž×¢×©×™× ×˜×•×‘×™× - saving lives, and for fulfilling the ×™×”×™ ×–×›×¨×• ×‘×¨×•×š of Ezra who continues to engender blessings in the world. So excited to be supporting this special project! Such an amazing way to continue to spread Ezra's positive impact on the world. Kol Hakavod on this important project. Ezra is never far from our thoughts. A wonderful important cause in memory of the wonderful Ezra Schwartz Z"L.
With the utmost love and respect for all of you! Ezra's memory continues to be for a blessing. Ezra continues to touch the lives of others. May his memory be a blessing. Kolkata hakovod on this worthy endeavor and special tribute to Ezra z"l; tizku l'mitzvot! Such an amazing and important project. In memory of Ezra z"l, and in honor of Josh, Dani, and Ariel - what an incredible way to honor the memory of your best friend. So proud of your efforts! Best of luck on this important endeavor. What a wonderful tribute to Ezra. May he continue to inspire you in all that you do. A wonderful way to remember an incredible friend. Kol hakavod for this beautiful tribute in memory of Ezra. Tizku l'mitzvot!